The post I’m currently working on: Recently Finished Friday, one of the memes we’ve been talking about forever but haven’t actually started yet. Our very first book haul! Of which Amy completed back in July, but I still haven’t done yet. But now is the perfect time because I have about 30ish new books in my book basket! The Sunshine Blogger Award. Okay, some people might get confused about this because Amy and I were actually nominated twice for this award, once by Elm, and then I was nominated once by Jordan when I was feeling down. So I’m talking about doing the one from Jordan, and then Amy and I will later do the one we were both nominated for after we got through our other a million tags and awards. Okay, so this post will include a Currently Reading segment, and I’m going to test drive Recently Finished Friday with a few books I’ve “recently” (I haven’t exactly had tons of time to read.) finished. Let’s get started! Anyway, I’m sort of making this up on the fly, so just go with it. Here are the questions you have to answer for this meme. What’s the title and author of your book? Cover image optional, but preferred. Please include a link to the Goodreads synopsis if you can. How long ago did you finish your book? (So we can see how fresh your feels are.) If you can’t remember, that’s okay. On a scale of one to ten, what would you rate your book? What’s your favorite and least favorite thing about your book? If you loved everything about your book, just say so. 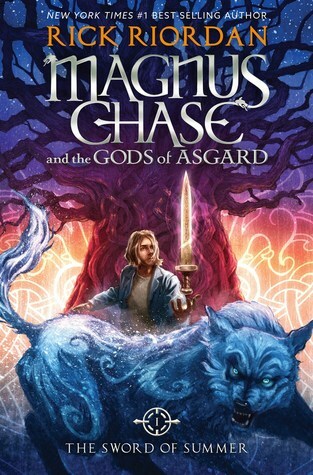 Okay, so the last book I finished was Magnus Chase and the Gods of Asgard Book One: The Sword of Summer authored by (Love that phrase! By the way, my laptop is getting on in years, so my keyboard isn’t exactly the greatest, so if you spot any typos: YOU’VE BEEN WARNED. Dun dun dun…) Rick Riordan. I finished it last night, Thursday, November 5th, 2015. But I’m currently reading another book, so my feels aren’t as fresh as they could be. On a scale of one to ten, I would rate this book a 8.7, and you’ll find out why in my rant. (Very excited for that.) My favorite thing about this book would have to be the characters, and not just Magnus, not that he isn’t great. I also loved Blitz, Hearth, Sam, and all the rest. Including the stupid, kooky gods. My least favorite part of this book was that it was exactly like the rest of his books. Now, before you freak out, let me explain. It was exactly like the other books, and that forced me to compare to the other books, which I really didn’t like because I found The Sword of Summer faulting compared to greats such as Percy Jackson and The Heroes of Olympus series. Which is not to say that I didn’t enjoy the book, I really truly did, just not as much as the others. Do you guys understand and/or agree with me? Please let me know! I don’t want to be alone!!! I thought Magnus was funny and witty and sarcastic and at first I started marking quotes with little scraps of paper like I always do when I read, but then I decided it would be an awful waste of paper if I had to mark every single page because every single page is full of sarcasm and wit. So I’m just going– Hang on! I’m multi-tasking and watching Pretty Little Liars, and I’m on Season Two, episode Twelve and Toby just came charging into the police station, saying that he loved Spencer but she just walked away and my heart just broke. If you love Pretty Little Liars as much as I love it, book or show, let us fangirl as one.— to give you a link to the Goodread’s quotes page and Amy and I are going to do a review about this book (our 4th!) and she still had all her quotes, so you see them there! Here it is: https://www.goodreads.com/quotes/search?utf8=%E2%9C%93&q=magnus+chase&commit=Search I highly recommend checking this out. Seriously, this is a booklover’s idea of a good tie. Right here. Seriously. Wow, okay. I guess I sorta went ahead and did my rant. And that concludes my first ever Recently Finished Friday! I really hope you guys like it! Please let me know what you think, and if you think this is something you might be interested in, GO FOR IT!!!!! Okay and now it’s 2:00. Wow, that took a while; maybe I won’t rant quite as much on my other books. It’ll be hard, but I’ll try. 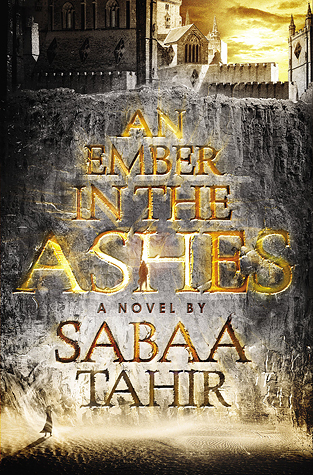 My next book is An Ember in the Ashes by Sabaa Tahir. 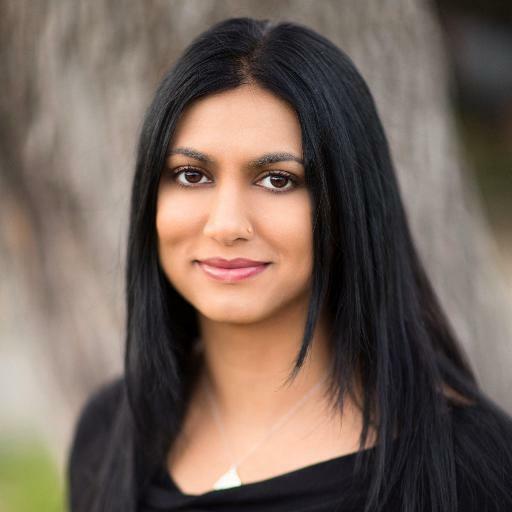 And the author of this book is so gorgeous, Iike exactly how I picture Bhramori, which she should know if she responded to my comment! Anyway, I have no idea how long ago I finished this book. A week? Two? I know I read a book inbetween these two, but I have no idea what it was! Oh, wait! It was Burned, a PPL book! But usually I can read a book in a night or less, two tops. It’s just recently I’ve had no time AT ALL! You guys know how busy I am! However, I haven’t forgotten how good this book is, so I’m rating it a 9.8. (I asked Amy what she should rate this, because it was hard, and she said the exact same thing I was thinking even though I hadn’t told her. That’s how much we’re alike! Creepy!) I loved almost everything about this book; I read it so long ago I don’t really remember anything I disliked. However, it didn’t have that special edge to push it up to a ten, but it was still very, very good. I love the characters, the plot, and Sabaa’s attention to detail. I thought the world-building was superb (I feel very dignified when I use that word!)! The only thing for me was it was a little too classic dystopian, you know? The perfect, hot, handsome male with emotional problems and the gorgeous girl, yeah, yeah, yeah. Don’t get me wrong, Dystopian is probably my favorite genre, but I’m always looking for something new. Sorry, guys. That’s probably it for my rant this time. Pathetic, I know. Butttt… I’ve been at this all day, soooo…. Moving on! Jordan, this one’s for you! 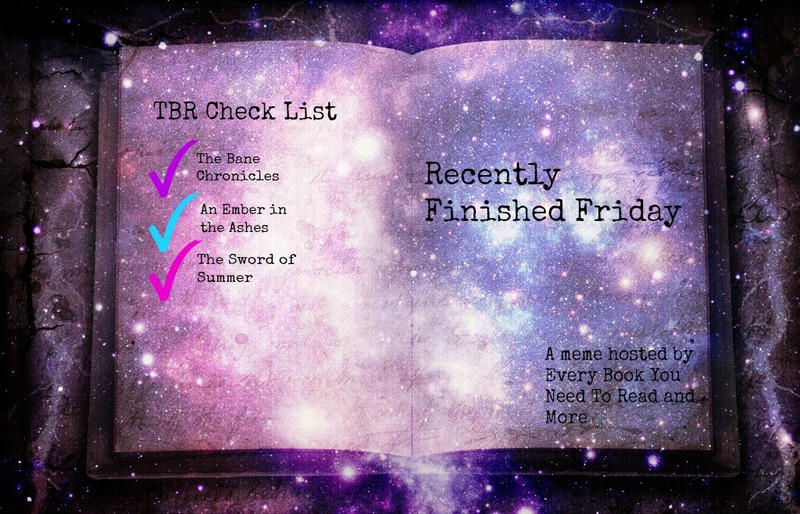 My next and final book is the one, the only, The Bane Chronicles! Inside the pages of this book lies my favorite character and couple of all time: Magnus Bane and his (ex?) boyfriend (Do they get back together in City of Heavenly Fire????!!! Please tell me somebody; I don’t remember!!!) This beauty of a book is by my favorite author, Cassandra (Not Judith, Michelle, not Judith.) Clare! I read this book two to three weeks ago, but my feels are still goin’ strong! MAGNUSSSSSSSSSS!!!!!!!!!!! ALEC!!!!!!!!!!!!!!!!!!!!!!!!!!!!!!!!!!!!!!! YOU’RE THE ONLY COUPLE I WILL EVER EVER EVER EVER EVER SHIP!!! (Other than me and my nose. It’s gonna’ happen, Michelle. It’s gonna’ happen! SHIP MY NOSE!!!!) This book is definitely a one-hundred. I mean, it’s by Cassandra Clare. Duh, guys. Duh. EVERYTHING IS MY FAVORITE PART!!!!! WHO DO YOU THINK YOU ARE??? Oh wait, me. Ummm, nevermind…. I LOVED EVERYTHING ABOUT THIS BOOK. Seriously, I had my pages marked with quotes, but, alas, my mom took it back to the library and I am so mad. So again, here’s the Goodread’s page: https://www.goodreads.com/quotes/search?utf8=%E2%9C%93&q=the+bane+chronicles+&commit=Search If you enjoyed the other one, you will definitely enjoy this!!! MY FAVORITE BOOK OF ALL TIME IF YOU HAVEN’T GUESSED THAT BY NOW!!!! This book is so, so funny. I always read during math class (Don’t worry, I have an A+. ), so you can imagine why everyone looked at me when Mr. Jones is ranting (and not in a good, entertaining Nikki type of fashion) and I burst out laughing like five times. True story, bro. I mean, it’s Magnus Bane, who(m?) is ALWAYS very funny, witty, sarcastic, clever, amusing, droll, hilarious, ludicrous, silly, a riot, mirthful, side-splitting, good-humored, and hysterical. Very much so. But this book is also very, very heart-breaking. Composed of short stories, I naturally found myself drawn to the ones with Alec in them. Those were my favorite. The last story……………………………….. In a sick, twisted way, I still loved it, even though it killed me and ruined my day. Does that make sense? My favorite, is the one where they have their first date because you get a better look at Alec that you’ve never gotten before because Clare doesn’t spend too much time with him in TMI or Magnus. Which is why I’m glad she wrote this book because before I didn’t know Magnus all that well before and now he’s my favorite ever, even above ZEKE!!! I know, I know, but Magnus is my favorite, guys! Yep. Pretty much sums it up. Sorry that last one was sorta rantorffic! As you can see, I am VERY passionate about that subject of wonder. I hate to ruin a snazzy ending, buttt… What do you think my very first edit?!?!? Sorry it’s so blurry; had to blow it up. Love ya!!!!!!! ‹ Previous3 current reads, and more exciting things! Next ›My Quick Version of Nikki’s Newest Awesome Idea! The edit looks really cool! JUst bought Magnus Chase on my kindle the other day, and I am really excited to start reading it. I loved Percy Jackson, so I can’t wait to see what Rick has planned for us now! Ahhh, waiting for a Riordan book is always hard, but definitely worth it. Glad to hear you enjoyed the book! Okay, stop the scratching, you’re ruining your hair. Well, um… see, your posts are all fab and lovely, but when you mention me… I don’t know, but it makes me feel like… like your post is getting undermined. Because of me. And I really, really don’t want to let that happen. 😦 You understand? And it’s okay, Nikki. Honestly, there ARE times when I don’t come across comments on my OWN blog, and I don’t even have two people running it. *facepalm* (Super-efficient, I know (but it’s mainly my app’s fault, though). You are a very lovely intelligent young lady (I’m good at grandma talk!) So I don’t understand what you’re saying at all, but if you like it, I will stop. Amy is too popular for me. I just crawl up in a ball on my bed and read books all day. Pshaw. Omg, on the topic of Magnus Chase, I totally agree with you. The characters were unique in their own ways, BUT, it used a lot of plot devices that you could see in Riordan’s previous books. In my review, I noted that and dropped a star, even though I still thoroughly enjoyed it. Oh oh I’m glad you mostly loved Magnus Chase! I agree most Rick Riordan books feel…the same after a while? But Magnus Chase is one of my TOP favourites. XD I also adored Sam and her magical hijab. OH MY GOD NICKI YES YOU AND YOUR NOSE ARE OTP YOU WILL LIVE HAPPILY EVER AFTER I, AS YOUR THERAPIST, CAN TELL YOU THIS WITH CONFIDENCE. Malec though ❤ They do get back together in CoH (THANK GOD I would be such a mess otherwise) I'm currently reading Magnus Chase and so far I agree with you. It's not just that the basic plot is the same, but Magnus and Sam remind me of Percy and Annabeth, but like the lesser versions. I just can't help but compare it to PJO and PJO is just better 😦 I'm still enjoying it though!